There’s been a lot of confusion about short sales, especially with regard to how they affect one’s credit score. Plenty of people have recommended them as an alternative to foreclosure, even going as far as to say they can spare you the nasty credit score ding. And while they can be a worthwhile foreclosure alternative, the credit score impact really isn’t much different. This has been an issue for a while because common sense and logic would tell you that a short sale is better than foreclosure. 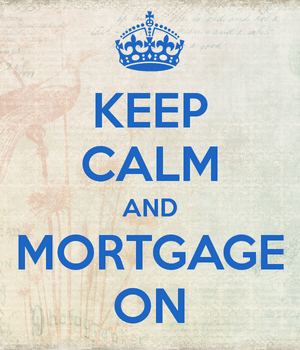 After all, if you choose to short sell your home, you’re making a conscious effort to work with your lender. As opposed to hastily packing your things and heading for the hills, or stripping your home of its precious copper and selling it on the black market. If anything, agreeing to a short sale should tell other creditors that you mean well, even if you can’t or don’t want to continue making your monthly mortgage payments on your underwater home. Unfortunately, this sentiment hasn’t translated to higher credit scores. Fico still sees foreclosures and short sales as very similar negative events. But why? Aren’t they totally different? Whether foreclosures and shorts sale are similar or not, data collected by Fico proves that those who short sell are higher risk than other borrowers. Fico looked at data from October 2009 to October 2011, discovering that more than one out of every two borrowers who experienced a short sale defaulted on another credit account within two years. The number was actually 55.1%. Yikes. Does this mean the floodgates were opened post-short sale? That the veritable seal was broken for many of these borrowers? Was their moral compass thrown and no longer incentive enough to keep up with their obligations? Or was it that the short sale itself really coincided with financial distress? Whatever the reason, it’s clear (from the data) that short sales and risk go hand in hand. As you can see from the chart, credit default risk post-foreclosure was even higher, at a rate of 72%. But Fico didn’t feel the difference (about 17%) was material enough to merit a “more positive treatment” for short sales. Additionally, most short sellers have mortgage delinquencies on their credit reports. To compare, roughly only one in 50 borrowers with a Fico score in the high 700 range defaults on one of their credit obligations. 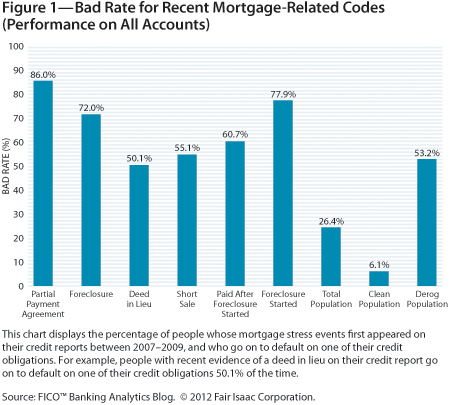 So clearly having that number jump from one to 25 is an issue, which explains why Fico smacks the credit scores of those who experience a short sale. What About Loan Mods and Fico Scores? There have also been a lot of questions about how loan modifications affect credit scores, or more specifically, Fico scores. Will that HAMP loan modification hurt your credit score, or is it just treated as a standard refinance? Currently, Fico says there is no impact (beyond perhaps a credit inquiry) as long as the loan mod is reported using the proper Consumer Data Industry Association (CDIA) comment codes. There was even a bill introduced to ensure loan mods didn’t hurt consumer credit scores. But Fico is currently evaluating whether the incidence of such events leads to greater credit risk. In other words, if the findings are similar to short sales, consumers who agree to a loan mod could see their Fico scores take a hit as well. But only time will tell on that one, since the data is so fresh. There’s plenty of re-default data out there though, so you have to wonder. It would certainly cause a lot of ruckus.